This film was one that intrigued me when I first saw it advertised. It definitely seemed like the kind of film I would enjoy and having watched it, I came away with a good feeling and felt like I’d been entertained very well. It was interesting to have the history of the main character, Adaline, told through flashbacks and voice-over narration. I found myself able to empathise with a lot of the characters in this movie. 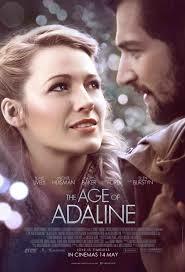 Not just Adaline herself, but her daughter and Ellis… as well as other people Adaline interacted with through the course of this film. It was also interesting to hear about the science behind what had happened to Adaline and the explanations about what had happened and why… although it did come across as info-dumping at times. Plus, I wasn’t sure exactly who the narrator was supposed to be. It was really good to see Adaline’s relationship with her daughter and how she still acted motherly towards her daughter, even though they looked like they should have been the other way round. I liked that Adaline had owned dogs throughout the years… but there were some aspects to that which made me a bit sad. I found it interesting that Adaline’s best friend was a woman who was blind. I was quite struck by the fact that was probably the only person Adaline could really strike up a long-term friendship with. I did like Ellis, even though his persistence was somewhat irritating at first. It was nice to see the relationship develop gradually between him and Adaline… and it was also good to see the rest of his family, too. There were a number of actors I recognised in this movie and I felt the cast worked really well. The ending seemed a little convenient, but it still worked and I still enjoyed watching this movie. It’s one I wouldn’t mind seeing again.